RIO DE JANEIRO, BRAZIL – Carnival and other Pre-Lenten celebrations are observed throughout the world from New Orleans’ Mardi Gras to Ecuador’s Fiesta de las Flores y las Frutas, but in Brazil the four days before Ash Wednesday, mark the country’s biggest holiday. Especially in Rio, the birthplace of samba music, the Carnival celebrations have become world renowned and are now a global icon of the city. An image from the 1930 Carnival in Rio, photo public domain. The history of Carnival is complex with dates and origin stories often debated. However, one thing is clear; in Rio, the modern day samba school competitions in the Sambódromo, the massive bloco celebrations that fill the streets and the gala balls held in various locations all share a rich and interwoven history. Carnival is said to have then spread to France and then throughout Europe. 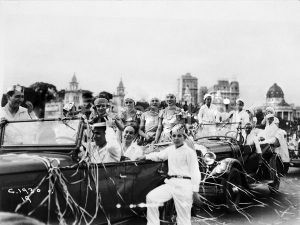 Catholic Portuguese settlers of Brazil are credited with bringing the Pre-Lenten celebrations to Rio de Janeiro with the first recorded Carnival taking place during either the 17th or 18th century. During the 19th century, different groups began to add to the celebrations in Rio. Some of there were “Grandes Sociedades” (Great Societies) which were luxurious parades held by aristocrats, and “Ranchos Carnavalescos”, which were organized working-class parades. There were also “Cordões” which were less organized groups of lower-class masked and costumed parading revelers. The Rio Carnival now is most well known for the massive samba school parade competitions at the Sambódromo, photo by Alexandre Macieira/Riotur. The birth of samba music in the city played a crucial role in the formation of what are considered contemporary Carnival celebrations in Rio. During this time, the groups known as Cordões gradually became blocos. The groups would parade in the streets with makeshift costumes while playing improvised samba songs. The practice is still observed today and the blocos make up the widely popular Carnival da Rua (street parade). Over time, though, some of the blocos wanted to be become more organized. It was then that the Escolas de Samba (Samba Schools) were born. According to one version of the story, Deixa Falar, the first group to call themselves a “samba school”, did so because they held their meetings near an actual children’s school. During the early 20th century the newly formed samba school’s parade became a competition. “I have fond memories of the neighborhoods participating and celebrating. It was whole families and generations there, together,” Ipanema resident Doralice Ferreira told the The Rio Times. “We would take lawn chairs and sit on the sidewalks. We watched the parades that way… and sometimes joined in. You can’t do that now because it’s too crowded,” she muses. Over the years, the numbers of the samba schools and spectators increased significantly. They grew so much, that in 1983, famous Brazilian architect Oscar Niemeyer was commissioned to build the Sambódromo as a permanent site for the competitive parade. 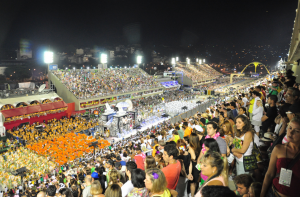 The top twelve samba schools are known as the Special Group and they compete in the Sambódromo on the final two days of carnival for the championship. The competition is broadcast live in Brazil and is increasingly televised internationally.